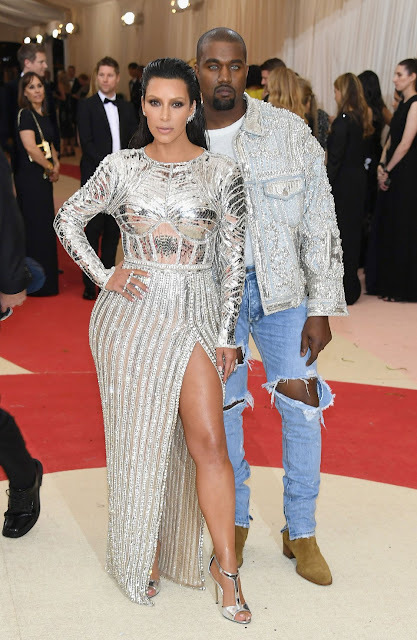 magazine for proclaiming that Kim Kardashian and Kanye West were the Best Dressed at Wintour's increasingly down-market annual Met Gala ball in New York. Says Vogue: "It’s not the first time that Kim Kardashian and Kanye West have coordinated their style. You might say it’s an art form that the pair has honed in their downtime, often subtly matching their off-duty looks with his-and-hers monochromatic ensembles, but little can compare to the stunning fashion moment they orchestrated on the Met Gala red carpet tonight"
Oh yeah? Kim managed to make this ultra expensive Balmain dress look, well cheap. As for Kanye's Fear of God outfit- those tragic slashed jeans were passe even when they were in fashion. Purveyor of uber smart Polish Vodka Vitek Czernuszyn who doubles up as the husband of Australian style queen and Bauer publishing maven, Australian Women's Weekly editor Deborah Thomas says : "Kim and Kanye declared best dressed at the Met Ball - REALLY? In a desperate panic at the loss of circulation and relevance amongst the under 30 year olds, American Vogue has resorted to courting the Kardashian's for their enormous following amongst the vacuous young. I guess you can't blame them for doing what they think is necessary to save the venerated 125 year old title- though the compromise in their integrity is considerable". Harsher words come from former Australian fashion expert and now top selling author Maggie Alderson who said of Kim'n'Kayne "American Vogue has just lost all its credibility, as far as I'm concerned. How is this well dressed anywhere? 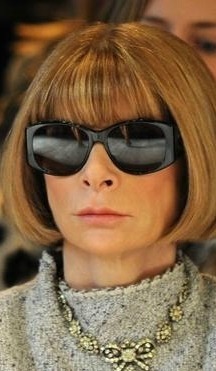 Let alone the Met Ball. Tragic - and craven." Ouch. As for Sarah Jessica Parker's interesting white outfit Maggie simply said : "lost for words".